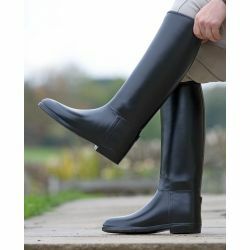 Offering durable practicality along with traditional highline, these high quality synthetic boots offer an expensive look at an excellent price. Offering durable practicality along with traditional highline, these high quality synthetic boots offer an expensive look at an excellent price. Cushion lined and featuring rear spur stops.